The Overview page allows you to check information about a network, the access points, and client devices. To access it, log in to the Linksys Cloud Manager. Once you are in the cloud interface, select a network to see the Overview page. To learn how to access the Linksys Cloud Manager, click here. This section provides you with an overview of the clients connected to a network and the traffic. Choose from Last 7 days, Last 24 hrs, Last 60 mins, and Real-time to monitor usage and traffic. 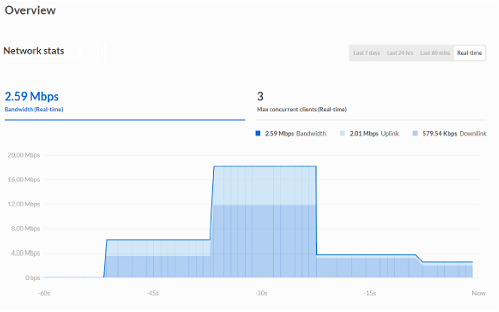 Click on the Bandwidth section to view the bandwidth traffic in the network. 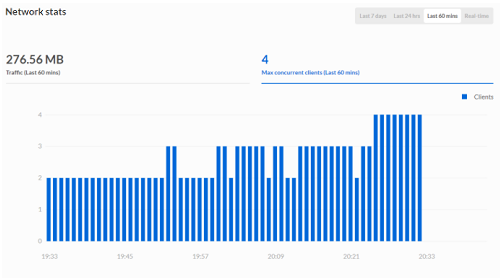 Click on the Max concurrent clients section to view client information. The area you click will be highlighted in blue. This section shows the network’s top clients by usage from the Last 7 days or Last 24 hrs. The default name of a client is its MAC address. To view the top clients, click More. QUICK TIP: To rename a client, click on a MAC address. In the device's Connection page, click on the ellipsis icon > Rename. Enter a friendly name in the field then click Confirm. This section displays a list of top access points per usage. Click an access point to monitor or configure its settings. To learn more, click here. To view the top access points per usage, click More. The Channel section displays the 2.4 GHz and 5 GHz channel data. The default channels on both bands are set to Au​to. When they are set to Auto, the graph shows all the channels available. No activity will be seen on the graph. When you have fixed radio channels, the graph will show activity on those channels. QUICK TIP: To change the channels, click Access Points in the top blue bar. Select an access point. Click Radio > Edit > select your settings and then click Save. To learn more, click here. This section displays the location of your access point (using Google™ Maps). 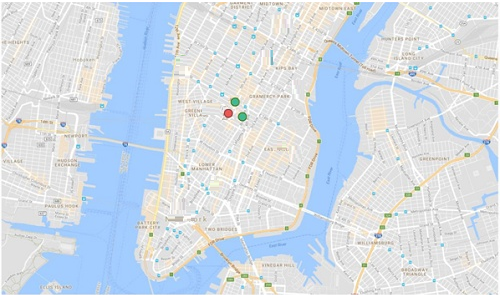 The green dots on your map indicate online access points and the red dots indicate offline access points. NOTE: Make sure to first set the location of each access point in order to see the location through this section. To learn more, click here.